Venom, the latest Marvel (anti) superhero film, limps into theatres this weekend with an unimpressive 30% on Rotten Tomatoes. However, I'm sure that won't prevent it from making boo koo bucks at the box office. What I'm more interested in is how Venom will fit into the annals of film history -- because it does! 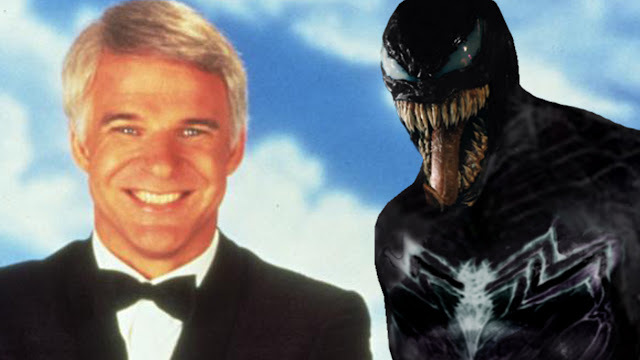 While this isn't my first Venom mashup video (see my The Venom Drop teaser trailer), I do think that my new mashup, All Of Venom, really speaks to what Venom ultimately will be remembered for: Tom Hardy's committed physical performance and how it plays as a companion piece to the 1984 romantic fantasy comedy All of Me starring (Steve Martin and Lily Tomlin). In Venom, Hardy's character Eddie Brock gets possessed by an alien symbiote and must learn to share his host body with said being. In All of Me, Martin's character gets possessed by the soul of the recently deceased Edwina Cutwater (Tomlin) and -- yup, you guessed it -- must learn to share his host body with said being. What's interesting is that if you look back at the reviews for All of Me -- which, make no mistake, fared much better than Venom among critics -- they all seem to agree that the most striking aspect is the impressive physicality of Martin's work. Likewise, Hardy appears to be working on the same go-for-broke wavelength in Venom.